Spinning is not as hard as it looks! 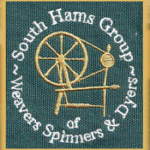 New members, whether experienced spinners or absolute beginners, are very welcome. We are a very informal and relaxed group. Do come along to a meeting and have a go, we’ll give you a welcoming hand. For beginners,we have a club wheel which can be hired for a small charge while you practice, and there is always someone on hand to help. We have days during the summer when we try out different methods of dyeing yarn, using both natural and artificial dyes. West Charleton Village Hall, West Charleton, Devon.